If you own a home that you have lived in for some time the chances are that you already have some equity built up in it. One of the options that many people consider when their credit card debt is becoming unmanageable is to refinance the mortgage on their home and tap into some of that equity, using the cash to pay off credit card balances in full. In essence you will be transferring your credit card debt into your mortgage loan, not wiping it out altogether as you would if you paid it down slowly and over time. The big advantage of that is that mortgage interest rates are far lower than credit card interest rates and you will have far more time to pay off the debts. One of the biggest reasons that people have so many problems paying off credit card debt is the ever increasing interest charged on remaining balances so a mortgage refinance does solve that problem to a certain extent. There is a downside to this method of credit card debt refinancing though. 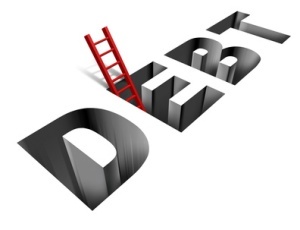 Credit card debt is unsecured debt and while credit card companies can call your home, send you letters, report your debt to a credit bureau and even in some cases take you to small claims court if you cannot satisfy your debt to them the one thing they cannot do is take yo0ur home away. If you fall behind on your mortgage though your lender can foreclose and take you biggest asset – your home – away. Therefore refinancing your home to pay of credit card debt is an option that needs a lot of thought before you proceed. If you still have a good credit record another option you can consider to refinance your credit card debt is to take out a personal loan with a bank or credit union. These kinds of loans are getting harder to obtain as banks have tightened their lending standards in the face of the credit crunch but if you have a good and long relationship with a certain financial institution you may still be able to obtain one. You should only choose this option if you can obtain a loan that has considerably better terms than those you are already being offered by your credit card companies. That means using a loan calculator (there are a lot of good, free ones available on line) to actually work out if you will be saving any money at all by paying off your credit debt only to take on a new debt in the form of a personal loan. As more people find themselves facing credit card debt that is beginning to get – or already is – out of control more and more companies are advertising that they can help with debt consolidation loans or by offering a debt consolidation service that promises a way to help you work with your creditors to settle your debt for less. On the surface this seems like a great idea and indeed to many people facing credit card debt it seems like the answer they have been looking for. Again though anybody considering this route to debt consolidation should proceed with extreme caution. The first thing that has to be taken into consideration is that these companies are not offering their services for free. While there are indeed some very high quality debt consolidation services that will work with creditors to secure some kind of favorable payment agreement for you for a reasonable fee there are also just as many – if not more – less scrupulous companies who do things a little differently. Some of these companies have you stop paying on your credit cards altogether and put the money into an account that they supervise. Once you have accumulated a certain amount in the account the company will then begin negotiation with the credit companies on your behalf to use some of those funds to pay off credit card balances in full. While there is nothing really illegal about this it can be a real headache for consumers to deal with. To begin with as you are not going to be making any payments to the credit card companies they will continue to call your home, write less than pleasant letters and threaten to report you to the credit card companies. If you take too long to fund your “settlement” account then you may indeed be reported to the credit bureaus as a delinquent debtor and the credit card companies may choose to file a suit against you in small claims court. Add to this that you will also be charged a fee by the debt settlement company which is often not insubstantial and this way to refinance credit card debt may not be the best idea. Though not really a traditional refinance if you can transfer the balances from high interest credit cards onto a credit card with a low APR – or one that offers a 0% APR for a certain amount of time – that is a way to help reduce the amount you will eventually have to pay back to satisfy your credit card debt as interest will accrue at a lower rate, meaning that more of the payments you do make every month go towards the principal and not just to pay off interest charges.